Less costly alternative - Fr Eugene Paul Teuma OFM Conv. Tuesday, August 14, 2018, 06:51 by Fr Eugene Paul Teuma OFM Conv. Do we really need a €55 million road project for the Rabat Road area? The authorities are pushing forward this project, while the residents, along the intended route, are asking for more moderate modifications. Is the Attard/Rabat Road project really a priority or a necessity? Living in the Rabat area for the last 11 years, and making use of public services, almost on a daily basis, I have to say that there are alternatives to the traffic and traffic jams mentioned. A trip to Valletta on a very busy morning could take up to 45/60 minutes, when a normal trip could take 20 to 25 minutes. Buses have fixed routes so they have to travel the same road every time, but motorists have the opportunity to take other routes to the same destination. They are free to take on a different route at will, but only a few seem to take up these options. People still insist in taking the “usual” routes, while there are others to be made use of. Possibly the use of GPS could also be part of the problem. The Attard/Rabat Road is one such main road. What is not being mentioned is that at least three four-lane arterial roads join the Rabat Road at a roundabout, half way to Rabat, and another just under Saqqajja. In spite of their width and size, hardly any traffic is observed on these roads. Traffic may be dense on this iconic, tree-lined main road, going up to Rabat, but traffic movement is rarely at a standstill (traffic jams). It is necessary to teach and inform our driving community how to diversify their traffic movements; many a time a longer route, with less traffic would help one to reach home/work earlier, rather than sitting it out on a “usual” transit way. Education would prove to be a less expensive solution than wasting €55 million on a new road system that will not deliver on what it promises. Where does the Rabat Road lead to? In the end it leads to Saqqajja Hill; a steep and narrow bottleneck lane (1¾ vehicle width) that will definitely remain a permanent bottle neck; do we want to demolish the chapel and the old buildings and fortifications to widen it? Moreover, all of Rabat’s roads and lanes are even narrower than that. So why have a four-lane road lead up more traffic, at a faster pace, to it? Traffic chaos would be more marked and intense. Mention is made that the new road would reduce travel time by half. It still would take 20/25 minutes to Valletta and back, and 15/18 minutes to Birkirkara. Speed signs (if ever anyone bothers to notice) on the way through Attard up to Mount Carmel indicate that one may not travel at more than 30km/h. Not more than 60km/h on the Attard/Rabat Road itself. Adding these together it would still take the same time to reach your destination safely. I recall that a former police commissioner conducted tests with actual police vehicles and concluded that speeding in Malta was a useless risk, since even travelling at breakneck speed one could only acquire 10/15 minutes extra time. So why are we speaking of reducing by half the travel time? The major traffic jams on this route occur generally between 7 and 9:30am and 4 to 5:30pm, primarily during winter school peak time. It is true, people have to wait in line to get to their destination, but as mentioned before, while buses and school buses have set routes, the private motorist and the service vans and truck drivers are not tied to such routes. Unfortunately, we find that many persist in using their “usual” route even when they know that they are going to get caught in the traffic. Rabat Road is an iconic tree and rubble wall-lined country road (a restoration project that cost €140,000 some years ago). Practically all other similar roads have been irremediably destroyed. It leads to Rabat and Mdina, offering beautiful country views. Tourists come to Malta to experience these unique, tranquil, and idyllic spots, rather than super-modern highways. Most of the 500 plus trees lining it are almost 200 years old; as a published work from the 19th century clearly states. Trees in Malta were introduced by the British as a means of reducing the aridness of the country. We, as inheritors of this country, are making a fine mess of our trees and countryside. Just take a look at the 100 or so trees within the Mdina ditch, pruned to destruction. These trees that used to produce excellent and abundant oranges, have produced none in the last decade, and have turned to wild shrub. Other trees “relocated” (you cannot relocate a 100- or 200-year-old tree for that matter) have not survived their translocation. 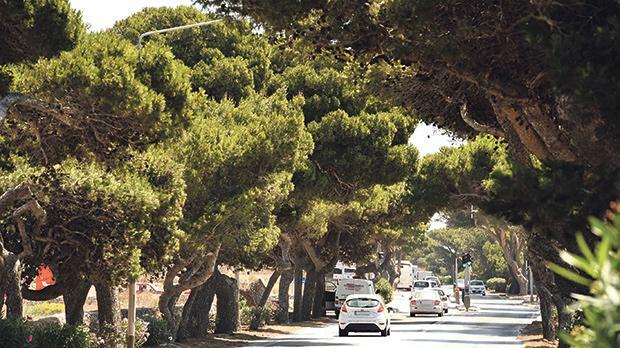 The latest “improvements” or “modifications” to the Attard/Rabat Road, still show that at least 300 trees are going to be “lost”. Can anyone tell us what has happened to “only five trees will be cut down” statement? With regard to removing traffic lights. If anyone is familiar with the Fleur- de-Lys Road and roundabout, one is also familiar with the traffic jams that constantly hinder progress on this road, as it joins the Mrieħel route. Traffic coming from the Birkirkara area is blocked for up to 15/20 minutes at a stretch, solely because traffic on the main arterial road does not give way to secondary traffic. With regard to traffic lights at San Anton junction and also the Ta’ Qali ones, their timing should be revised, but they should not be removed. With regard to archaeology. The route leading to Rabat is packed with history and possible archaeogical locations. Just to mention one site, below Saqqajja there is a famous niche that marks the spot where the Turks stopped and turned back on their intended attack on Mdina. The area around clearly indicates a possible defensive/attack position for the defenders. Widening the road would obliterate this site, and much else. Yet another site would be the rest of the Wignacourt Aquaduct that is located below ground level within the perimeter fields running to the side of the road. Other alternatives can be found to the Rabat-Attard road issue. Education would be preferable to a major project that will not solve the primary problem at hand. Maybe printed maps, indicating routes other than the usual ones, and other educational material could help. On the other hand, the Rabat-Attard road needs some proper upgrade; road width should be standardised, a pedestrian way running from Attard to Rabat, should be constructed. All this and more can be done for a much cheaper fee of €55 million.